Emma surveyed the gifts in front of her, each presented by a handsome servant. Stranger though she was to this time and place, and playing Guinevere’s role for the first time, she still knew that this was a test. 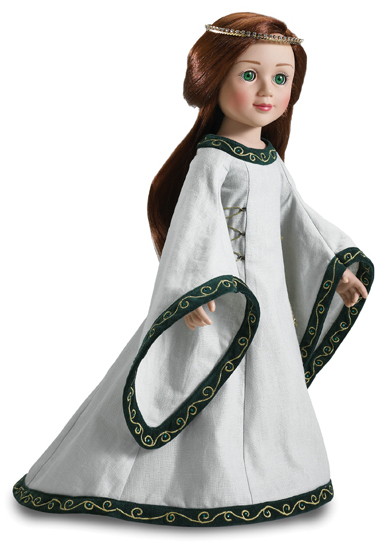 Depending on the gift she chose, old Merlin would judge whether she was a bride worthy of King Arthur. Emma passed down the row of gifts once more. The long train of her green linen gown skimmed a ruby-studded chest. A carved ivory mirror briefly caught the flash of gold embroidery and velvet and rhinestone trim of her dress. Her delicately laced slippers slid over a soft, silver-threaded carpet. But Emma didn’t pause until she reached a servant bearing a simple but exquisite gold and diamond circlet. “This is my choice,” she announced. The servant before her bowed, then raised the crown to Emma’s head.